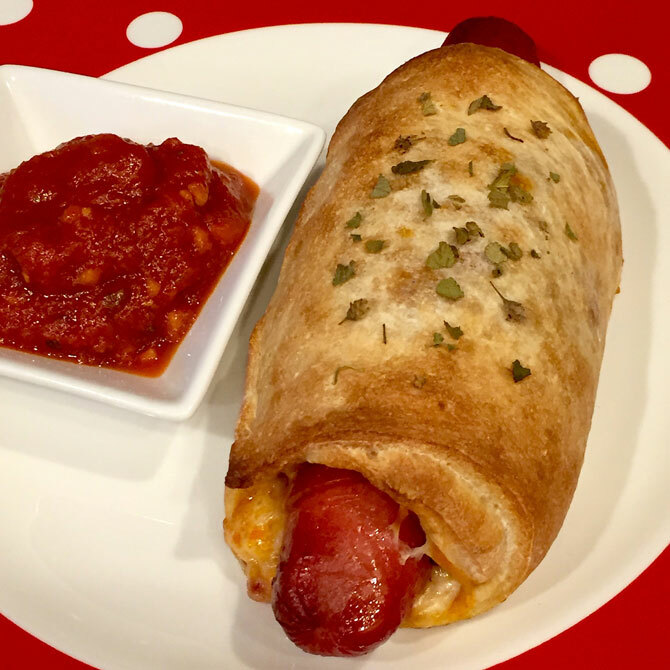 Combining our love of hot dogs and pizza, for kids and adults alike…perfect for a Halloween party or quick-fix dinner. You can find pizza dough at your supermarket or buy it fresh from your local pizzeria! Roll the pizza dough out to 1/4-inch thickness and cut it into 4 rectangles. Spread 1/4 cup of marinara sauce in the center of each square of dough and nestle a Hoffy Hot Dog into the sauce. Surround each hot dog with 6 pieces of pepperoni and top with a 1/3 of a cup of shredded mozzarella cheese. Season with a sprinkling of dried oregano. Wrap the dough around the hot dog, leaving the ends of the hot dog exposed, and press the edges together where they overlap. Place the wrapped hot dogs, seam side down, on a baking sheet and bake for 20 minutes or until golden all over. For kids, serve cut in half, for bigger appetites serve whole!